The Puu Oo-Kupaianaha eruption of Kīlauea is the volcano’s longest rift-zone eruption in more than 600 years. Lava flows have buried 43 square miles (111 km2) of the volcano and added 544 acres (220 ha) to the Island of Hawaii. The eruption not only challenges local communities, which must adapt to an ever-changing and sometimes destructive environment, but also draws millions of visitors to Hawaii Volcanoes National Park. U.S. Geological Survey (USGS) scientists closely monitor and evaluate hazards at Hawaii’s volcanoes and also work with park rangers to help ensure safe lava viewing for visitors. Volcanic gases escape from vents on the crater floor of the Puu Oo cone, located 12 miles (19 km) east of the summit of Kīlauea Volcano. Since 1987, repeated collapses of the cone have resulted in a crater more than 1,300 feet (400 m) long. The crater floor is 40 feet (13 m) below the lowest part of the rim. In the distance (upper left), steam plumes rise where lava flows pour into the sea, about 7 miles (11 km) south of Puu Oo. USGS photo by Richard Hoblitt, May 2002. On the evening of January 29, 1997, scientists at the USGS Hawaiian Volcano Observatory (HVO) hastily returned to work as a swarm of earthquakes struck Kīlauea’s east rift zone. Deep within the rift zone, magma (molten rock) was escaping from the conduit leading to the Puu Oo vent, cutting off the supply to the ongoing eruption. The lava pond at Puu Oo drained, and residents 10 miles (16 km) away heard a low, rumbling roar as the crater floor dropped 500 feet (150 m) and the west wall of the Puu Oo cone collapsed. A few hours later, as magma found a new path to the surface, the ground cracked in nearby Napau Crater, and lava fountains lit up the night sky. At dawn, HVO scientists were impressed by the size of a new gap in the west flank of Puu Oo. Even after 15 years, monitoring the eruption was anything but routine. Kīlauea is Hawaii’s youngest volcano and one of the world’s most active. More than 90% of its surface has been covered by lava flows in the past 1,000 years. Kīlauea erupts either at its summit or along its east or southwest rift zones. From the early 1800s through 1954, the volcano erupted mainly in its summit caldera. Since 1955, however, most eruptions have occurred along the east rift zone. The Puu Oo-Kupaianaha eruption, which has produced more than half the volume of lava erupted by Kīlauea in the last 160 years, is by far the largest of these. The Puu Oo-Kupaianaha eruption began on January 3, 1983, on a remote stretch of the east rift zone, 12 miles (19 km) from the summit caldera. The early years of the eruption were remarkable for lava fountains as high as 1,500 feet (460 m) that erupted episodically from Puu Oo. Most lava flows erupted from Kīlauea Volcano since A.D. 1790 (shown in red) originated from the east rift zone, which extends 34 miles (55 km) from the summit caldera to the eastern tip of the Island of Hawaii. Lava flows from the present eruption (shown in yellow) span more than 9 miles (15 km) along the coast. Hawaii Island consists of five volcanoes, including Kohala, Mauna Kea, Hualalai, Mauna Loa, and Kīlauea. Puu Oo, the main vent of the eruption, straddles the boundary of Hawaii Volcanoes National Park. From mid-1983 through mid-1986, Puu Oo erupted every 3 to 4 weeks, usually for less than 24 hours. The towering lava fountains, visible and audible for miles, built a high cone and fed thick, blocky flows of aa, the less fluid of the two types of Hawaiian lava flows. In July 1986, the eruption shifted 2 miles (3 km) downrift to a new vent, Kupaianaha, initiating 5 1/2 years of continuous, quiet effusion. 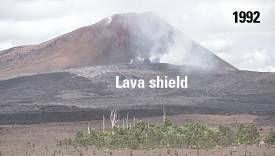 A lava pond formed over the vent, and frequent overflows built a broad shield 185 feet (56 m) high in less than a year. On November 28, 1986, flows from Kupaianaha reached the ocean, 7.5 miles (12 km) away, cut a swath through the community of Kapaahu, and closed the coastal highway. Over the next 5 years, lava flows overran houses on either side of the ever-widening flow field. 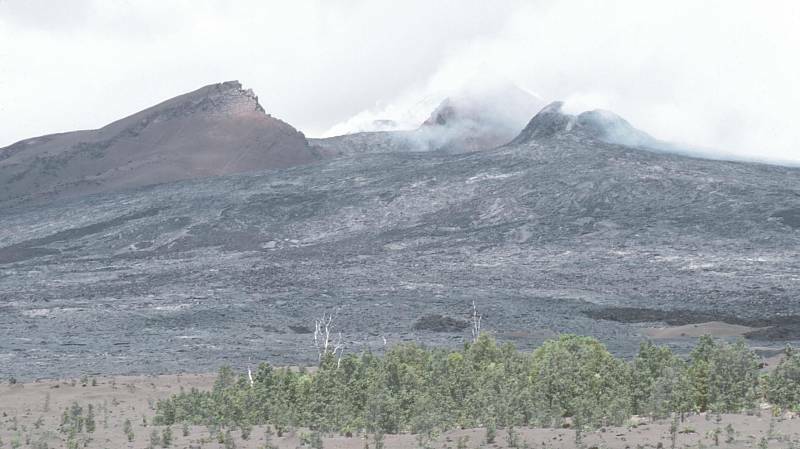 By 1991, lava output from Kupaianaha was in steady decline. Magma pressure increased uprift of Kupaianaha, and new fissures erupted between Kupaianaha and Puu Oo for 3 weeks in November 1991. 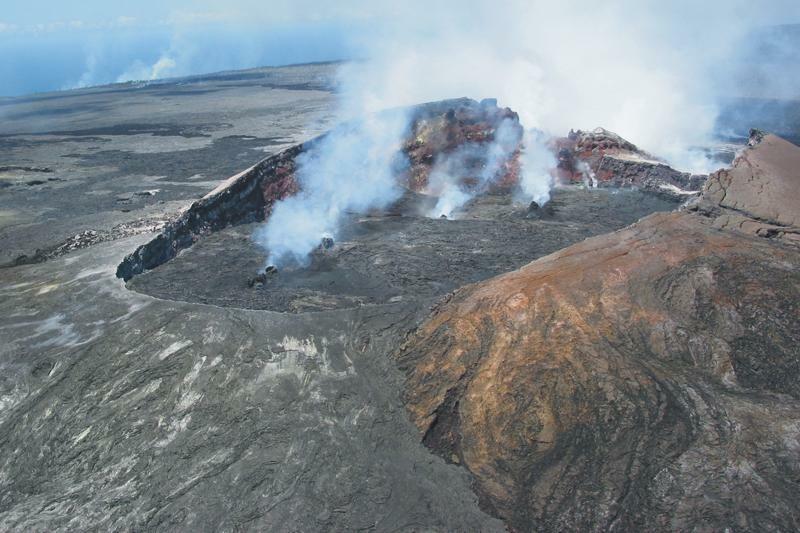 Lava discharge from Kupaianaha continued to wane and, on February 7, 1992, finally stopped. 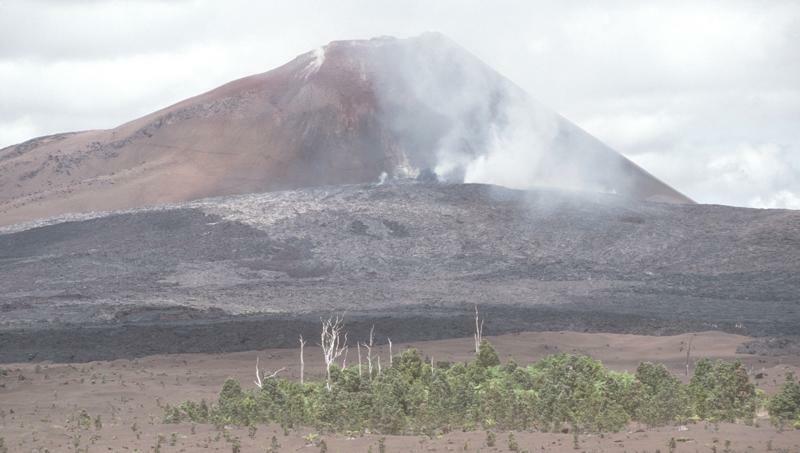 Ten days later, the activity returned to Puu Oo. Low lava fountains erupted from a fissure on the west flank of the massive cone. This was the first in a series of flank vents that built a lava shield 260 feet (80 m) high, banked against the slope of Puu Oo. From 1992 through 2002, nearly continuous effusion from these vents sent lava flows to the ocean within the national park. During the first 3 1/2 years of the eruption, fallout from lava fountains at Puu Oo built a cinder-and-spatter cone 835 feet (255m) high, more than twice as high as any other cone on Kīlauea's east rift zone. Cone growth ceased after the activity shifted to Kupaianaha in mid-1986. When the eruption returned to Puu Oo in 1992, lava flows from flank vents built a shield against the west flank of the cone (left). in 1993, collapse pits appeared on the west flank of Puu Oo as subsidence over the flank vents undermined the cone. 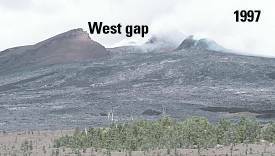 When the floor dropped in January 1997, the weakened flank also failed, leaving the prominent "west gap." Note growth of the shield (right). USGS photos by Tari Mattox and Christina Heliker. In May 2002, lava flows from a new vent on the west side of the shield advanced along the western margin of the flow field and sparked the largest forest fire in the park in 15 years. By late July, these flows reached the sea at the end of Chain of Craters Road, drawing as many as 4,000 visitors per day. The high lava fountains at Puu Oo from 1983 to 1986 produced mainly aa flows that were typically 10 to 15 feet (3-5 m) thick. Because of the short duration of each fountaining episode, none of these flows reached the ocean. After the eruptive activity changed from episodic to continuous in 1986, pahoehoe, a type of lava more fluid than aa, predominated. The main lava channels exiting the Kupaianaha and Puu Oo vents crusted over and formed tubes that eventually extended to the ocean. Tubes insulate lava from heat loss, allowing it to remain fluid and travel far without cooling. Tube-fed pahoehoe flows have formed a barren plain as thick as 115 feet (35 m) that spans 9.5 miles (15 km) at the coast. Since late 1986, lava has poured into the ocean more than 70% of the time, by far the longest such interval in at least 600 years. More than 540 acres (220 ha) of new land have been created as lava deltas build seaward over steep submarine slopes of lava rubble, black sand, and pillow lava (the submarine form of pahoehoe). Such steep slopes are unstable and prone to slumping, which removes support for the active, leading edge of the lava delta, or "bench." When a bench suddenly collapses, several acres of land can slide into the sea in less than a minute. Large collapses are highly dangerous and frequently precipitate violent steam explosions and scalding waves. Four people have died near Kīlauea’s active lava deltas (see USGS Fact Sheet 152-00, Viewing Hawaii’s Lava SafelyCommon Sense is Not Enough). The current eruption ranks as Kīlauea’s most destructive since A.D. 1790. Between 1983 and 1991, lava flows repeatedly invaded communities on Kīlauea’s southern coast. In 1990, the flows from Kupaianaha covered the village of Kalapana, leading to a Federal disaster declaration for coastal communities destroyed by the eruption. At the same time, the creation of new land and stunningly beautiful flows in the national park have drawn millions of people to experience and enjoy volcanic activity up close. The continuous emission of more than 1,000 tons of irritating sulfur dioxide gas (SO2) each day from Kīlauea’s erupting vents has resulted in volcanic smog, or "vog," downwind of the volcano. SO2 in the eruption plume reacts with oxygen, water, and particles in the air to form the sulfuric-acid droplets and solid sulfate particles that produce vog and acid rain. Vog aggravates preexisting respiratory ailments and damages crops. Acid rain leaches lead from roofs, contaminating household water supplies. Since early 1992, lava flows have remained mostly within Hawaii Volcanoes National Park, reducing the immediate threat to residential areas. The geologic history of Kīlauea, however, indicates a high likelihood of continued activity on the east rift zone, even after the present eruption ends. To provide reliable and timely warnings of eruptions, USGS scientists at HVO continuously monitor Hawaii’s volcanoes.